OPEC’s new deal: Fudgy math or fuzzy stats? The deed is done and not a single Iranian appeared visibly riled in the end. Following the conclusion of OPEC's 174th Ministerial Meeting on Friday here in Vienna, Austria, the cartel announced a 'nominal' production hike of 1 million barrels per day (bpd). But the futures market expected more and has gone into full bullish mode as the weekend approaches. At 18:32pm BST on Friday, the WTI front-month futures contract was at $68.77, up $3.23 or +4.93% and Brent was at $74.88, up $1.83 or +2.51%. 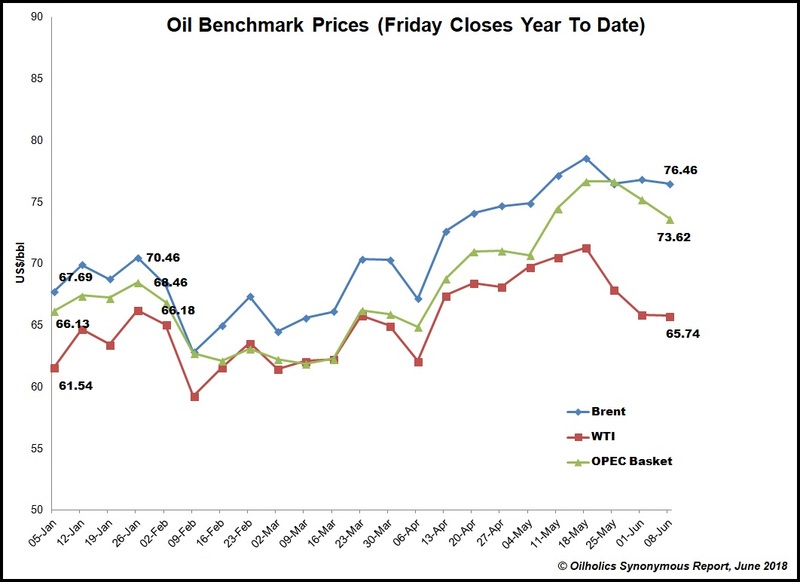 Both benchmarks more than recovered their overnight declines, as traders who – like the Oilholic – delved into the OPEC statement, encountered some real fudgy math or perhaps fuzzy stats. It seems all what OPEC has done is "insist" on 100% compliance with a 1.2 million barrels per day (bpd) cut it put forward in November 2016. The cartel's claim is that some of its members 'overcut' due to their own enthusiasm, or due to circumstances, geopolitics or lack of investment (Latter cases to be read as Libya, Nigeria and Venezuela). According to OPEC, this meant that compliance with the cuts touched 152% in May, instead of 100% or 1.824 million bpd. So now all OPEC has asked its members to do is bring compliance down to 100%, or put 624,000 barrels back on to the market and not a million! Of course, as has become the norm for over a decade now, OPEC did not reveal which individual member will do what and who is or isn't partaking in the exercise. That's the compromise to keep Iran onside for the moment. Here is one's Forbes piece for a more detailed perspective; but it is a jolly old fudge here at Helferstorferstrasse 17. And oh, by the way, Congo's request to join OPEC has been accepted. So, if there's an OPEC-Plus or a Super-OPEC, it'll have 25 members to begin with. That's all from Vienna for the moment folks! More tomorrow when OPEC chats to its 10 non-OPEC counterparts.Keep reading, keep it ‘crude’! The prospect of ‘OPEC-plus’ or ‘Super-OPEC’? 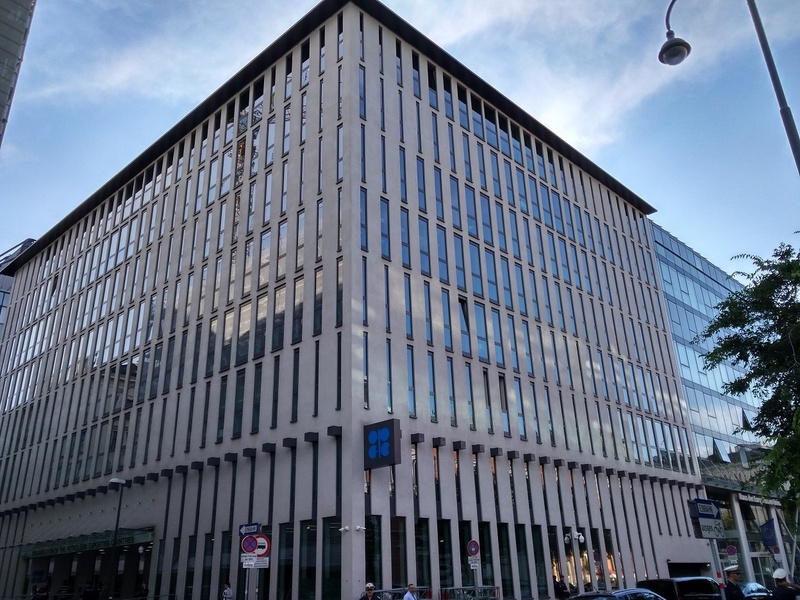 With the OPEC International seminar done, half of the world's scribes and analysts, including yours truly, have now descended on OPEC HQ for the 174th Oil Ministers Summit, and the chatter about altering the global crude market order is all the rage here. Its been helped in no small part by UAE Oil Minister and current OPEC President Suhail Al Mazroui. 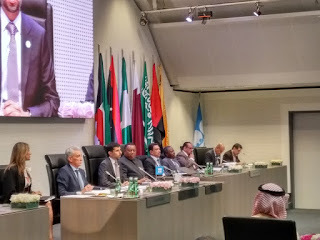 Following hints from various OPEC member delegates at the seminar, in his opening remarks to the ministers summit, Al Mazroui said he wanted to "institutionalise" the alliance between 14 OPEC oil producers and 10 non-OPEC producers leading to the creation of a much bigger crude cabal. Full report on Forbes here. Well we had what's dubbed as 'R-OPEC' dominating discourse back in November when the Russians last arrived to shake hands with OPEC, and brought other non-OPEC producers along for the ride. So, what would this new creation be called? The Oilholic's preference is for 'OPEC-plus'; afterall the johnny-come-lately(s) can only be described as additions to a decades old organisation. Of course, for dramatic effect, some have suggested 'Super-OPEC'. Chances are – should it happen – that neither of the two would be adopted, and that a designated policy wonk would come up with some bland name with a catchy acronym. That's all from OPEC for the moment folks. More later in the day. Keep reading, keep it 'crude'! © Gaurav Sharma 2018. 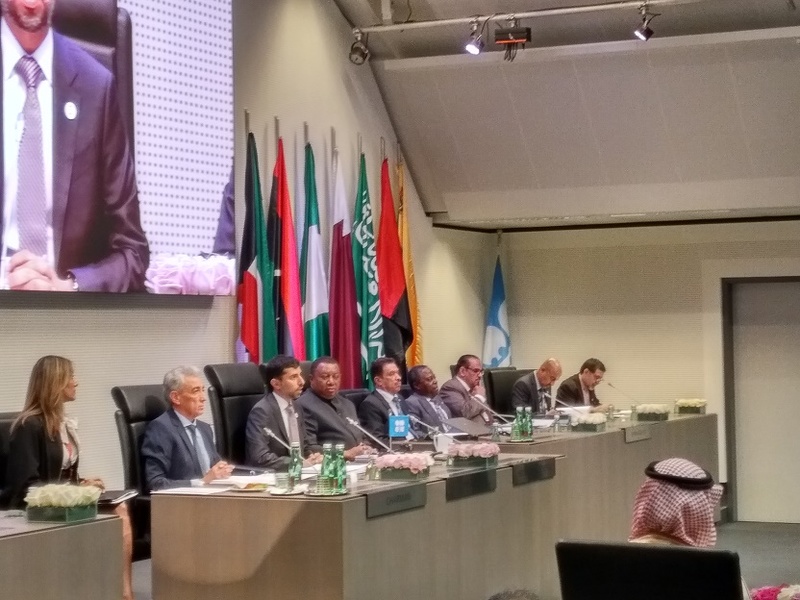 Graph: UAE Oil Minister and OPEC President Suhail Al Mazroui (third from left) speaks at 174th OPEC Ministers Meeting in Vienna, Austria © Gaurav Sharma 2018. We were led to believe that a $100 per barrel oil price was not a case of "if" but "when." Over April, and early on in May both Brent and WTI futures continued their upticks, primarily driven by hedge funds piling into the front end of the futures curve, and OPEC hinting at extending its production cut agreement. 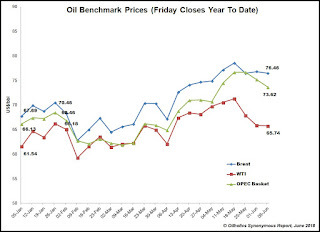 Even six-month dated Brent contract's backwardation streak started to narrow, though it ultimately stayed in backwardation mode, as the Oilholic noted in a recent broadcast. And then it happened – information came out that the Saudis and Russians were no longer keen on extending the existing OPEC/non-OPEC production cut agreement, that has seen 1.8 million barrels per day (bpd) taken out of the global supply pool by 14 OPEC and 10 non-OPEC producers. Furthermore, if a Reuters exclusive is to be believed, the US demanded that OPEC production be raised by 1 million bpd. The same story also claimed that President Donald Trump's unilateral slapping of sanctions on Iran only came after the Saudis allegedly promised to raise their output. Sidestepping all of this, the Oilholic has always maintained that the barrels OPEC and non-OPEC producers took out of the market to – in their words "balance the market" – had to return to the global supply pool at some point. That was the real "when not if" situation for the market. As market sentiment on that happening has gained traction, the predictable result is a visible correction in the futures market with OPEC set to meet on 22 June. Meanwhile, the $100 price remains a pipedream, with both benchmarks still oscillating in a very predictable $60-80 range, only occasionally flattering to deceive with bullish overtones only to slide backwards (see graph above, click to enlarge). Away from the crude price, here are one's Forbes posts on US oil producers maintaining their efficiencies drive despite relatively higher oil prices and the UK-France Channel Tunnel operator's latest sustainability initiative of using ozone friendly refrigerants for cooling it landmark tunnel. Finally, it's a pleasure to have the Oilholic mentioned and recognised by third parties. These include Feedspot who recently featured this blog in their ‘Top 60 oil and gas blogs to follow’ section. It comes after industry data provider Drillinginfo flagged this blog in its roundup of '10 great oil & gas blogs to follow', as did penny stocks expert Peter Leeds, and US-based Delphian Ballistics. A big thank you to all of the aforementioned. That's all for the moment folks! Keep reading, keep it 'crude'! © Gaurav Sharma 2018. Graph: Friday closes of oil prices year to 8 June 2018 © Gaurav Sharma 2018.